…And they are so dumb. Why is this a problem for the former White House Press Secretary, who, in that job, got to watch her boss amble past a global financial melt down? It’s obvious! You know what’s scariest about this latest Fox News craptasm? Perino was actually the least insane voice in the conversation. The other two hacktaculars on air with her were upset that Obama had the effrontery to stop by the monument at all, where as Perino, at least, thought it OK for a President to get a few minutes at the site. But dear FSM, give me strength. I take a couple of messages from this bit of foolishness. First, again, Peak Wingnut lies in Cantor territory:* it infinitely retreats, to be approached but never reached. Second, last time I looked there were actual problems in the world, here at home and abroad as well. Just one or two. Our society formally locates the process of addressing such problems in our political system. It would help if those who interpret politics for the public actually connected their analysis to anything real. When future historians wonder just how it was we were able to trigger the afterburners in the power dive of our republic, the transcript of this little snippet will give them a clue. **Saw that in a tweet. Wish I’d thought of it myself. Actually, no I don’t. 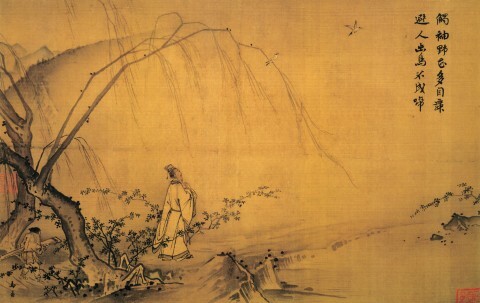 Image: Ma Yuan, Walking on a Path in Spring, before roughly 1225. This entry was posted on September 5, 2014 at 5:51 pm and is filed under MSM nonsense, Republican follies, ridicule, Stupidity. You can subscribe via RSS 2.0 feed to this post's comments. Well, I guess someone has to pay attention to the news so people like me can read blogs about it. Thanks for the public service. But you expected politics to be sane? They’re so consistently insane that I’m tempted by bipartisan conspiracy theories. I’m not in a position to do much about it, especially in that scenario, so I just try to keep a general feel for where it’s at.